Haddon House, located in Metro Vancouver, offers you a rare opportunity to vacation in one of the world's most beautiful cities while staying in a quiet, upscale neighbourhood of million dollar homes. Only 20 minutes from the excitement of downtown Vancouver, this elegant, heritage home is a peaceful haven just steps from Burnaby's Deer Lake. 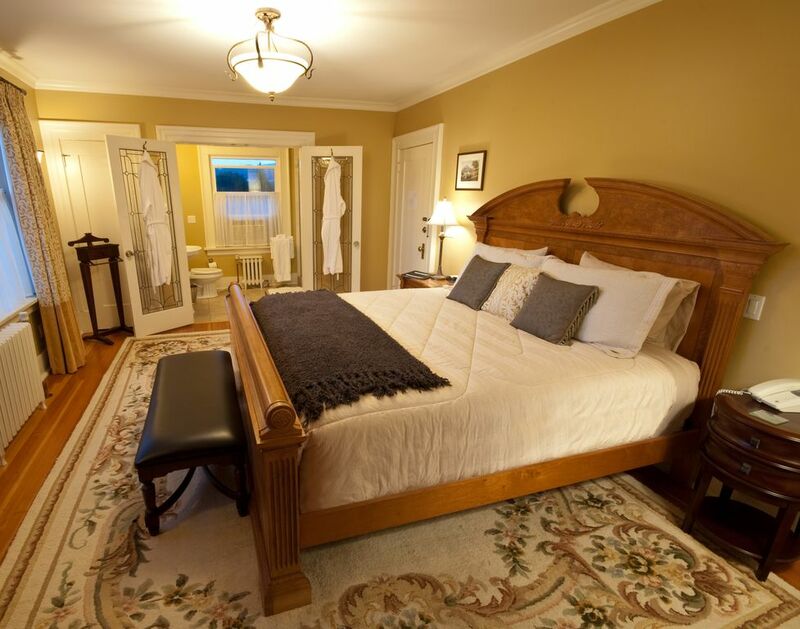 While you vacation at Haddon House you’re free to have exclusive use of all the home has to offer. There is a separate self-contained hosts' suite in the lower, permitting the hosts to offer you the best of both worlds - complete privacy for guests as well as additional complimentary concierge services, if desired. These would include tips and assistance with tourist information and directions, dining and other reservations etc. Nearby Attractions: One block from Haddon House lies Deer Lake - one of Metro Vancouver's best-kept secrets with its abundance of walking and biking trails, canoe and paddle-boat rentals and picnic areas. Also within easy walking distance is the area's cultural hub with live performances taking place year-round. Drive a short 7 minutes to British Columbia's largest shopping mall, or park your car for the day and take a 20-minute Skytrain ride into the heart of Vancouver's downtown. More on our Rooms: This award-winning, 2600 sq. ft. home is luxuriously furnished with modern amenities and surrounded by views of British Columbia's Coastal Mountains. The Dutch Colonial style of this professionally decorated 4 bedroom and 3.5 bathroom heritage home has been lovingly maintained throughout a complete renovation. Updated to offer you modern amenities such as wireless Internet, in-floor bathroom heating, pillow-top mattresses, and flat-panel televisions in each bedroom, Haddon House provides the perfect setting for your corporate retreat or family vacation. All bedrooms are elegantly furnished with a king or queen size bed, plush armchairs and air conditioning. There are three bathrooms, two of which are ensuite, as well as a powder room (1/2 bath) on the main floor. Hosts Johannes and Marie-Louise Stolz are a Swiss-Canadian couple who are fluent in both English and German. Award-winning heritage restoration. Experience the best of the old (architecture) and the new (modern amenities) in this heritage designated residence. Immaculate standards of cleanliness. All second floor bathrooms have in-floor heating, blow dryers, bathrobes & slippers, soap, shampoo and conditioner. A view of the Coastal Mountains can be seen from the back of the house. Our gourmet kitchen comes fully equipped with stainless steel appliances, a Miele dishwasher, toaster oven, blender, kettle, coffee maker, microwave oven, warming drawer and convection oven. Simply awesome place with an equally awesome host. Beautiful, clean, very well and thought out supplies provided by the host. Very warm and caring welcome provided by the host. Follow through by host during our stay. And hosts also sent us home with wonderful book on British Columbia. House is well kept and equipped. We were 2 families, each 4, amd had very comfortable stay. In short, we will definitely look to rebook this place next time. Our humble thanks to hosts for making this a memorable trip. So glad to hear your stay at Haddon House and our beautiful city was memorable. Hope to see you back again! Beautiful house, every room is wonderful, very comfortable all around - it's an absolute treat to be in such an old home and one that has been redone to perfection. Great neighborhood & location and Deer Lake is a pretty place to walk. The hosts are the best, - we felt really welcome and pampered. Not many places like this out there. Everything about this home was wonderful. They have gone above and beyond to insure comfort. I was not expecting all of the food they had waiting for us. Many thanks for travelling across the border to visit our home in the beautiful mellow autumn season we have been enjoying these past few weeks. We trust your family created some precious memories while here. Hope to see you back! Thanks so much for letting us know how much you enjoyed not just the interior but also exterior of our residence. Our aim is to provide a complete experience to our guests. We hope your plans will include another trip to Haddon House in the future! We all loved our stay in the this beautiful remodeled vintage house. British Columbia is known for its beauty, from the coastal mountains to the beaches and the ocean. Located only 20 minutes from downtown Vancouver where you'll find lots of entertainment, fine dining, markets, museums, music and so much more. Haddon House is just a short stroll away from Deer Lake where you can dine at the historic Hart House Restaurant and tour the Burnaby Village Museum and other art galleries. We're centrally located in the heart of Burnaby's cultural district and near all that Burnaby and Vancouver have to offer. If you love shopping, we are located only a 7 minute drive (or bus ride) from Metropolis at Metrotown - B.C. 's largest shopping mall. For recreational activities, a huge sports complex with swimming pool, ice rinks soccer fields etc are only a short 5 minute drive. For ski enthusiasts, we are located less than a 1/2 hour's drive from 3 local ski hills, as well as a 2 hour drive from the world famous Whistler/Blackcomb ski resort.